Ryan Collins was born to fish the diverse waters of Cape Cod. He grew up about 150 yards from Cape Cod Bay and about a mile from Cape Cod Canal, and caught his first mackerel at 5 years old with his dad. As a teen, Ryan got a job in a bait shop and started working fishing charters, and has more or less never looked back from the fishing lifestyle. 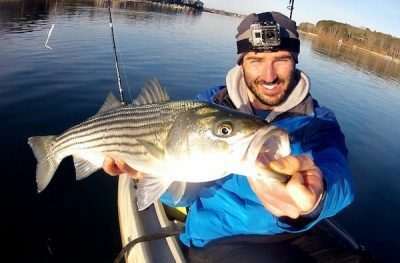 At different points throughout the year, Ryan can be found running fishing charters for the seasonal striped bass population during the high season, or freshwater fishing trout and bass in the area off-season. Ryan can even be found offshore fishing for bluefin tuna, and when the weather turns, the occasional stab at ice fishing or traveling farther afield to get his fix. In 2011 he started My Fishing Cape Cod, a hub for the diverse fishing in the Cape Cod Area. The site boasts 10,000 loyal subscribers, some of whom support the site as paid members. Earlier this year, Ryan partnered with NBC Sports Boston to launch a My Fishing Cape Cod TV series, reaching some 300,000 households. I use a Humminbird 798 HD SI mostly because it has a side-scan sonar, which allows me to find fish that I would otherwise miss if I only had traditional sonar. It also has GPS built in and the price was right at under $1,000. I do not use a trolling motor because the type of fishing I typically do does not warrant one. Yes I have a Hobie Outback kayak and it is a tremendous fishing tool. I would never fish out of a regular kayak again. By using my legs to propel the kayak I really never get tired, plus it frees up both of my hands for casting and fishing. I use the SailFlow app every single day. It is probably the most accurate wind prediction app I know of. I use GoPro HERO4 cameras with waterproof cases to capture underwater footage which I use on my website, YouTube and on our television show on NBC SportsBOSTON. We used a drone (a DJI Phantom 4) last September while filming a TV episode. The primary purpose of the drone that day was to capture some nice scenic footage of Cape Cod, however once we got the drone into the air we quickly realized there was a huge school of striped bass swimming just off the beach. We ended up using the drone to locate and stay with the fish, which was really unexpected and very cool to experience.